Enterprises are faced with the daunting challenge of engaging their employees, customers, and partners in today's hostile and dangerous online environement. They are increasingly turning to layered security approaches that help them stay secure in the face of potential failures of process or technology. 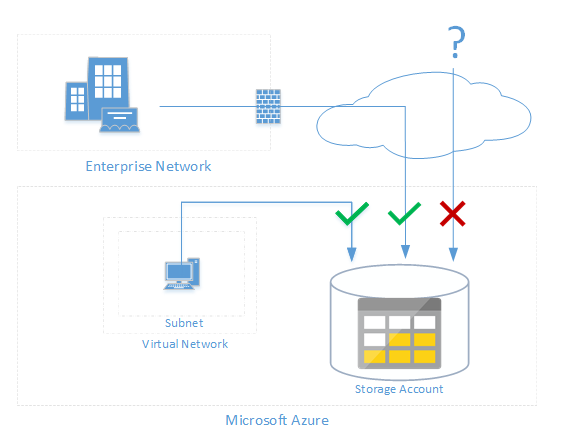 To help our customers address this challenge, the Azure Storage team is excited to announce the preview of Firewalls and Virtual Networks for Azure Storage. With this preview, the authorization capabilities of Azure Storage are expanded to allow administrators to also control which networks have access to their data. By leveraging the recently announced Virtual Network Service Endpoints, administrators can now create network rules that allow traffic only from selected Virtual Networks and subnets, creating a secure network boundary for their data. On-premises networks and other trusted internet traffic can also be granted access using network rules based in IP address ranges. These rules can be managed using the Azure portal, PowerShell, CLIv2, and Azure Resource Manager templates. To learn more and get started with Firewalls and Virtual Networks for Azure Storage, check out Configure Azure Storage Firewalls and Virtual Networks​.